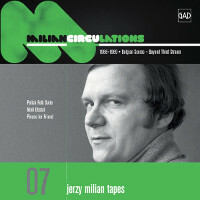 This is the seventh installment of the archival series released by GAD Records, which presents the work of Polish Jazz vibraphonist / composer / bandleader Jerzy Milian. This chapter is dedicated to Milian's recordings from mid to late 1960s, done in Belgium with the Belgian (Radio & TV) BRT Jazz Orchestra, directed by Etienne Verschueren. The album presents six original compositions, three of which are three part suites, all composed by Milian. Milian would of course return to work with the BTR Jazz Orchestra in the 1980s, which is documented on the third installment of this series. The music is a wonderful orchestral Jazz, which at the time was considered as part of the searching Third Stream, which was supposed to merge Jazz and contemporary Classical Music, as initiated by the American composer Gunther Schuller in the late 1950s and had many sympathizers among leading American Jazz musicians in the 1950s and 1960s, but never became part of the mainstream of Jazz per se. Milian did not follow the Third Stream conventions by the letter, but his complex compositions and Jazzy improvisations by the orchestra on top of the scores can be without doubt associated with the idiom. In some respects Third Stream was an attempt to Europeanize American Jazz and failed mostly due to the basic cultural incompatibility between mainstream American Jazz and sophisticated European contemporary Classical music, which Americans rejected but some Europeans (Milian included, but also the great Polish composer Krzysztof Penderecki and many others) embraced warmly. Milian's compositions are absolutely brilliant and remain completely valid half a Century later, as if composed today. Sophisticated, elegant, clever and beautifully melodic, in some cases incorporating Polish Folklore sources, this music is alive and kicking as it was at the time it was created. The BTR Jazz Orchestra included many excellent instrumentalists, who performed the difficult music without a hitch. Overall this is an incredible piece of Polish/European Jazz history, which absolutely deserves to be heard and studied. With Milian's recent passing it is even more important to document his work and bring it to the public. For orchestral Jazz enthusiasts this album is an absolute must!